US and Iraqi troops surrounded a group of villages and are carrying out raids, but a security official said insurgent leaders had left before they arrived. The operation near the town of Samarra is not as huge as has been suggested, correspondents say. Local people say there has been little if any combat. The troops carrying out the operation are said to have detained about 40 suspects but 17 of these were later released. The joint US and Iraqi force said it had captured a number of weapons caches, containing shells, explosives and military uniforms. 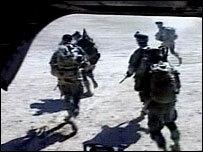 The Iraqi foreign minister said the aim was to stop insurgents from turning the town into a stronghold. But a senior Sunni Arab politician criticised the operation, which came a day after the new Iraqi parliament met for its inaugural session. "[The US forces] are surprising us with meaningless acts at the time Iraqis are looking forward to the first session of the parliament, preferring the political solution, not the military one," Saleh al-Mutleq told Reuters news agency. A bomb attack last month on the al-Askari shrine in Samarra, 100km (60 miles) north of Baghdad, sparked widespread sectarian violence. The US military said the assault, dubbed Operation Swarmer, was intended to "clear a suspected insurgent operating area" north-east of Samarra. They describe it as the biggest airborne operation in Iraq since the US invasion in 2003, involving more than 50 aircraft and 1,500 troops. The BBC's Andrew North in Baghdad says the Pentagon has been keen to publicise it, releasing video footage to the media not long after the assault began. But it is now clear this was nothing like the air strikes of 2003, and the US military has confirmed no bombs were dropped or missiles fired, our correspondent says. The operation was described as an air assault, a term the US military uses for bringing in troops by helicopter, although many people initially took the phrase to mean aerial bombing. However, it involves more helicopters airlifting American and Iraqi troops into the target area than any similar campaign in the three years since Saddam Hussein was toppled. Iraqi police sources in their regional headquarters said several small villages in the largely desert area had been sealed off. They quoted local residents as saying they had heard loud explosions from just before dawn on this second day of the operation. They also said they believed a number of people had been killed or injured. Interim Foreign Minister Hoshyar Zebari told the BBC that intelligence from Iraqi security services suggested insurgents had gathered in the area to plan terror attacks. The offensive is expected to last several days.